Buy Printer Epson WorkForce Pro WP-4525DNF with refillable cartridges and make 30 times more quality prints for the same money! Pay only 0.04 USD for A-4 full color print! Workforce pro wp-4525dnf epson with CISS вЂ“ is a new multi-function inkjet printer designed for use in a small office as well as at home. Due to wide functionality and record low cost price this multifunctional device has recently become very popular among the users. Qualitative characteristics combined with the compactness of the device and cost-effective printing, scanning and copying allow us to say with certainty that the proposed model of the printer with extra features вЂ“ is a unique product from the world-famous manufacturer of printing equipment вЂ“ the Epson company. Printer Epson workforce pro wp-4525dnf uses the preinstalled continuous ink supply system during printing. This provides cost-effective printing, especially when printing large volumes. The cost of prints in Epson workforce pro wp-4525dnf printer вЂ“ is 50% lower than in conventional laser printers and MFPs, and 20-30 times lower when using original printing consumables. This device uses minimum of consumables, compared to laser printers and MFPs, what allows to save on maintenance of the inkjet printing device. The photo ink from INKSYSTEM company вЂ“ means printing quality. Due to the use of special water-soluble ink from INKSYSTEM in Epson PRO wp 4525dnf, the device provides high quality prints, even on plain paper. Photo inks dry for a couple of seconds, what allows them not to spread out and not to be seen from to the other side. 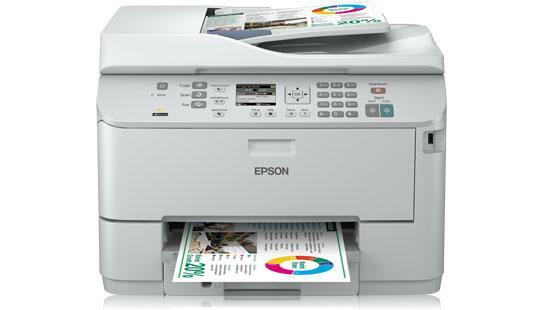 epson wp-4525dnf provides high quality of the final results because of its resolution of 4800x1200dpi, what provides users with the sharpness of text and image reproduction: photos, flyers and posters, as well as any other office documents. Office inkjet multifunctional epson workforce pro wp-4525dnf all-in-one printer with CISS is highly reliable in use, due to a special printing technology вЂ“ Epson Micro Piezo. Also be sure to check a fairly new model of printer epson stylus sx130 and epson stylus office bx305fw plus, which is similar to the one mentioned above in its technical features. How to purchase the multifunctional device? You may buy epson workforce pro wp-4525dnf price very fast, without spending much effort and without overpayment what is the most important. You can do it right now on our website, by calling our managers. Besides our experienced professional consultants will answer all of your questions and give appropriate recommendations how to use printing techniques such as the proposed model and any other one. Our website features a wide range of products and affordable prices. Thanks to the special printing technology called MicroPiezo, there is no need to warm-up the device workforce pro wp-4525dnf printer вЂ“ with CISS, so its optimal printing speed is achieved almost immediately. First page will be printed out for about only 3 seconds. New epson printer workforce pro wp-4525dnf вЂ“ this is the device that has all the basic features you need in office. Ability to print, copy, scan and fax. The ability to use two-sided printing. Ability to use double-sided copying and scanning. The printer has the ability to use the main paper tray paper with the capacity of 250 sheets. The printer has an additional paper feeding tray with the capacity of 80 sheets, which is used for printing on thicker media. Option of the DADF вЂ“ duplex automatic document feeder. Use of special cartridges of standard, increased and extra increased capacity.